Thunderstorms in the country followed days of still air that was heavy and thick with humidity. The leaves on the poplar trees outside my bedroom window would begin to flutter and eventually turned their backs toward us as though they were bracing for what was to come. The birds were scurrying back to their nests to take shelter and the squirrels and chipmunks sped quickly toward their homes without looking back. 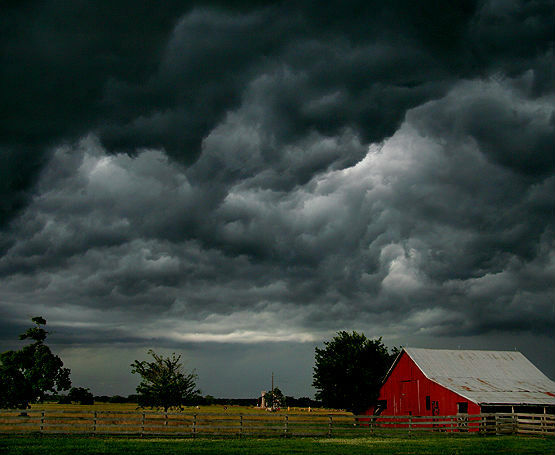 The sky changed from a playful, summer blue as the heavy, dark, grey clouds rolled in over the old house. The largest, darkest clouds appeared menacing and powerful as they hung low over the yard turning mid-day into night. I could see the first streak of lightning as it lit up the sky around Mitchell’s barn. Seconds later, the thunder crashed so loud that I instinctively ran downstairs hoping to find some comfort in the grownups who had gathered in the living room. “There’s nothing to be afraid of.”, Mother would say, matter-of-factly, as Great Aunt Clara sprinkled holy water over the lamps and the around the doorways. “Let’s play a game and count the seconds after the lightning flashes to see how close the thunder follows.” she said. I wasn’t in much of a state to play a game and wondered if this was her way to take my mind off of the dangers of the storm. The rain was coming down in sheets and the wind was pounding it against the kitchen windows so hard that I thought that any minute they would break. Another bolt of lightning lit up the house followed by the ominous crash and I wondered if it had hit one of the big maple trees outside. Great Aunt Clara scurried into the living room without glancing my way, as though she knew that I’d see the sheer terror in her eyes. This went on for several minutes that seemed like hours, until the flashes became less frequent and the thunder moved off in the distance and the whole house and all of its occupants seemed to breathe a collective sigh of relief. I went back upstairs and watched from the window until the dark clouds moved along in the sky back toward the railroad tracks. It was as though someone had turned the lights back on and patches of blue dotted the sky again and the sun burst out from behind the big grey mass overhead. There would be many storms in the country over the years and they all began and ended the same. It would commence with ominous skies, deafening thunderclaps and a shared fear of the unknown. It would end with calm skies, nervous laughter and gratitude for the abundance of rain that had quenched the thirsty farmlands around us. This entry was posted in Short Stories and tagged lanark county, Tay Valley Township.